Bryn Mawr Glass & Mirror has been serving the Delaware County community for over 60 years. We pride ourselves on the friendly and professional service we’ve provided to our loyal customers during that time, and continue to provide. Delaware County residents can trust in the knowledge and honesty of the Bryn Mawr Glass team. We’ll make sure you find the right glass or mirror for your project -- and at the right price. We know how important it can be to stick to a budget, and we would never try to sell you an expensive piece you don’t need. As a rule of thumb, we treat every client like a family member. This way, you know you’re getting a great and honest deal. Visit our Facebook page for our latest project photos. Right from our showroom, we offer different types of glass to suit any need. In fact, we stock a variety of designer glass suitable for windows, doors, light fixtures, and even cabinets. 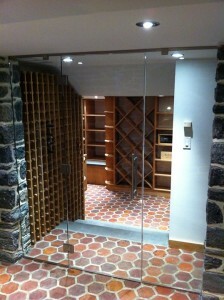 We also provide restover glass in varying, distinct styles. Restover glass is machine drawn fire polished glass that adds an elegant touch to any glass product. It also works perfectly for light restoration projects We offer authentic old world colonial glass, handmade in Europe. This glass is perfect for replacing antique blown glass dating back before the 1900’s. This type of glass is still made the same way today, a master craftsmen mouth-blows each piece of glass. It combines looks of clarity and movement. Be sure to stop by our Havertown showroom to see the latest in design, or to gain inspiration for your next project. Our staff is happy to help you find the perfect glass products, even if you’re not sure what you need. For anything from a shower door to a mirrored room, we’ve got you covered. Even if you just have some basic questions, contact us or visit our Main Line glass company showroom to get some ideas for your next project. Give us a call at (610) 853-2990 for a free Delaware County glass measurement and estimate.